Wesley Haramule invites you to drop in to enjoy a Classic Pizza recipe which has been perfected by the family over the years. Pizza is the specialty but a wide variety of cuisine, from bar appetizers to full course meals or be tempted by our daily specials with friendly service and atmosphere that is unique to a small town. 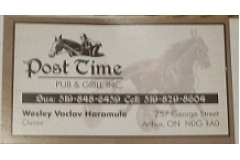 Post Time Pub & Grill provides a fun and entertaining environment. Relax with a beverage and watch a game on one of our four T.V.s around the bar. We hope to provide a hometown feel while visiting or passing through Arthur. A welcoming "oasis" to the family, groups and travelers.